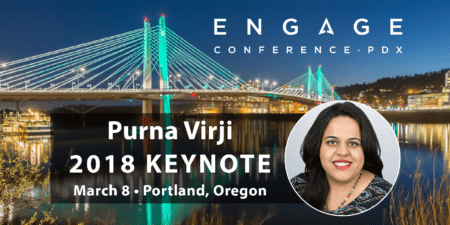 Purna Virji will be giving the Morning Keynote at Engage 2018, which will take place March 8th, 2018 in Portland, Oregon. For more information or to purchase tickets, please click here. Like most of us search marketers, I found my way into the industry quite serendipitously. I’m a former journalist and TV producer, having produced a series of award-winning talk shows on public television in Philadelphia. We had amazing guests on the show, from Nobel Prize winners like Wangari Mathai, to conservationist Jane Goodall, to Deepak Chopra, and we had the best crew to work with. I loved every minute of it. But fate intervened, and when my son was born with health issues I reluctantly realized that I needed to cross over to the dark side, i.e. working in PR instead of journalism. The dark side paid better and more importantly, had much better hours. At the same time, my best friend was working for AOL in London, and was talking to me about this thing called SEO and PPC. She got me interested and I went to my CEO asking if this was something we could test out and offer to clients. Long story short, he gave me some room to experiment and test and that’s where my love for search was born. Since then, I’ve worked in-house, agency side, and even consulted independently. And now, in my current role as Senior Manager of Global Engagement, I get to fully channel my inner journalist. I love that my role involves creating stories and narratives to help evangelize Microsoft’s products and services to our audiences via industry events and 1:1 client engagements. It’s the best of both worlds. 2) In 3 years, Bing Ads will be _____ relative to AdWords. Bing isn’t just a search engine, we’re Microsoft’s search engine. That means we’re part of a much larger entity that has decades of success in technology innovation. Microsoft and Google think about Search in different ways and that’s what will start to determine where Bing Ads goes relative to AdWords. Artificial intelligence, the proliferation of smart, connected devices and the massive amounts of available data are transforming the role of search in digital experiences. Our vision is that search is ubiquitous, goes beyond the search box and adapts to changing information needs and technology habits. Bing is at the forefront of this evolution, serving as a critical service layer and platform across Microsoft. Microsoft is already the leader in AI research and development, and Bing is the intelligent fabric that weaves through Microsoft’s product suite such as Cortana, Windows 10, and Skype. As Microsoft continues to invest in AI across the company, Bing is at the core of that investment and Bing intelligence is powering many of these services such as digital agents and cloud offers, such as Cortana. At the same time, Bing is utilizing Microsoft AI capabilities to provide new consumer services, such as image search and intelligent answers, and for better Bing ads targeting, custom ad experiences and marketing automation tools. As search becomes a ubiquitous service, it will be able to understand intent and consumer behavior in more dimensions than a search term, such as considering preferences, habits, and schedules. The increasing amount of data and increasingly sophisticated machine learning capabilities will provide an ever deeper understanding of the consumer. And for marketers, the ability to reason, understand and interact with consumers will enable stronger relationships with more efficiency and impact. 3) It has been a very long time since I’ve treated a Bing Campaign more than marginally differently than its corresponding AdWords Campaign…and when I do, it’s likely because AdWords has a functionality that Bing has lacked. I’m not alone here. How do you respond to that? That’s been one of the advantages to getting started on Bing since marketers’ to-do lists are generally longer than what can be accomplished in a 24-hour day. We’ve made it incredibly easy for advertisers to import their campaigns from Google with just the click of a button. The Google Import feature can even be automated to import on a daily, weekly or monthly basis. That helps advertisers get up and running, but there are huge ROAS wins to be had by digging a little deeper. Remember, simply mirroring isn’t enough when the audience and marketplace are different. – Bing offers unique features that Google doesn’t have, such as multi-image extensions, chatbot extensions, and in-market audiences for search. – CPCs tend to be lower across multiple verticals on Bing while conversion rates tend to be higher. This means that marketers should adjust their budget and CPCs to more effectively maximize ROAS. 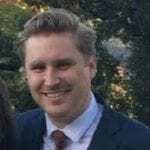 – 27% of the clicks we get on Bing come from searches that are unique to the Bing Network (U.S. click data from Microsoft internal data, July 2017). – Bing has accumulated one of the largest indexes in the world of online behavior. Combined with Microsoft’s Audience Intelligence Graph that is based on many signals such as Microsoft ID, search history, domain preferences and product preferences, it enables the Bing Network to have the best understanding of user intent, and harness it for more personal and relevant ad experiences. – With the acquisition of LinkedIn, our ability to understand user attributes with the LinkedIn Graph can give marketers an even more comprehensive view of audiences that matter most to them. Pay attention to your Bing Ads campaigns—even a few min a day or week can make a big difference to your bottom line. 4) One area where Bing > Google is in their outreach to search professionals (with you being a prime example of that). Why has Bing placed a big emphasis here? Thank you for saying that! ? The entire Bing team is super passionate about customer-centricity and it’s a real joy for us to connect and engage with our customers. Customer obsession is a core part of Microsoft’s overall values and culture. It’s not just lip service- our entire leadership chain of command right from our CEO Satya Nadella to managers across Bing, leads by example. We’re encouraged to go out there and engage with our customers to learn from them and listen to their needs. This helps us bring solutions that don’t just meet the customer needs, but often surprise and delight them too. Every project we work on, has to start by thinking of the customer and their needs. A great example of this is our User Voice feature that helps determine what products and features our engineering team works on. We don’t dictate the priorities, we listen to our customers and work on what’s a priority to them. We take this so strictly that every engineer is assigned to certain products and part of their job every single day is to check user voice for the keywords/tags that are associated with their products. They even have to respond to one post a day. There are numerous examples of when we’re made product updates, changes or added new things 100% based on your requests. Additionally, to help our customers properly understand our products and features, we launched the Bing Ads Academy. This online learning portal provides a convenient solution for those newer to Bing Ads to learn at their own pace, via bite-sized learning videos. We love working super closely with our customers and with the industry – and when we’re encouraged to do it – we love working here even more. 5) What are some upcoming Bing Ads Innovations that you can share with us? – Multi-image ad extensions: Think of this almost like visual sitelinks. Five images, with corresponding text titles, can be added as an ad extension when the ad shows up in mainline position one. – In-Market Audiences…for search! Bing Ads’ predictive intelligence identifies users who have shown purchase intent signals within a particular category, including searches and clicks on Bing and page views on Microsoft services, to create audience lists unique to Bing Ads. By reaching these audiences, you’re able to reach a group of high-quality, potential customers and enjoy higher engagement and conversion rates. – Chatbot extension: Add the power of chat to your ad. How it works is customers give us 50-100 of their top questions and we build a bot for them. The extension shows up under the ad and when clicked brings up a Skype chat box. And so many more! Keep an eye out on the Bing Ads blog or follow folks like Frances, Nickie, and myself on Twitter to get all the latest details.